Amsterdam, The Netherlands – Royal Philips (NYSE:PHG, AEX: PHIA) today reported Green Product sales of EUR 11.8 billion in 2013, accounting for 51% of total sales and reaching the company’s EcoVision 2015 sustainability performance target two years ahead of time. All sectors contributed to the growth of Green Product sales. Healthcare expanded its Green Product portfolio with 13 new introductions that improve patient outcomes, provide more value and expand access to care. Efforts in reducing environmental impact were recognized by COCIR³, claiming each of Philips 1.5T MRI models to have lower energy consumption than the market average. The use of recycled materials in Consumer Lifestyle continued, resulting in over 330 tons of recycled plastics being used in vacuum cleaners and almost 250 tons in irons. In 2013, Philips invested EUR 509 million in Green Innovation, with Lighting leading the way (EUR 327 million) in advancing the development of LED solutions. In April, Lighting announced a breakthrough in creating the world’s most energy-efficient LED lamp (TLED) that delivers 200 lumens per watt of high-quality light. Philips’ EcoVision program comprises key performance indicators in the areas of improving people’s lives, Green Product sales, Green Innovation (incl. 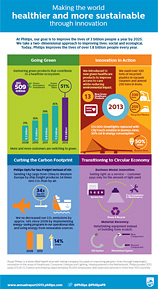 Circular Economy), Green Operations, Health & Safety and Supplier Sustainability. 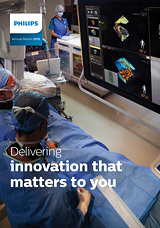 For more information of 2015 targets, please visit Philips Annual Report 2013. ¹ Green Products need to prove leadership in at least one Green Focal Area compared to industry standards, which is defined by a sector specific peer group. This is done either by outperforming reference products (which can be a competitor or predecessor product in the particular product family) by at least 10%, outperforming product-specific eco-requirements or by being awarded with a recognized eco-performance label. The Green Focal Areas are: Energy efficiency, Packaging, Hazardous substances, Weight, Recycling and disposal and Lifetime reliability. ² Circular economy is a driver for innovation in the areas of material – component and product reuse, as well as business models such as solutions and services. In a circular economy, the more effective use of materials enables to create more value, both by cost savings and by developing new markets or growing existing ones. ³ According to COCIR (European Coordination Committee of the Radiological, Electromedical and Healthcare IT Industry), the Philips 1.5T MRI fleet average energy consumption in ‘off’ and ‘ready-to-scan’ mode is deemed 20% lower than the average consumption of the market fleet for 2012. 4 To calculate how many lives we are improving, market intelligence and statistical data on the number of people touched by the products contributing to the social or ecological dimension over the lifetime of a product are multiplied by the number of those products delivered in a year. After elimination of double counts, the number of lives improved by our innovative solutions is calculated. In 2013 we improved the lives of 1.8 billion people.